The European Space Agency declared the death of its massive Earth-observing satellite Envisat today (May 9) after a month of mysterious silence from the school bus-size spacecraft. Envisat is the world's largest Earth-watching satellite for civilian use, with ESA officials touting its 10th anniversary in space earlier this year. 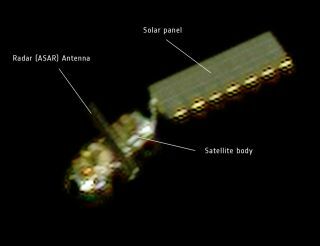 The $2.9 billion satellite was originally designed to snap high-resolution photos of Earth for five years, but managed to last 10 years during its successful mission. The troubles for Envisat began April 8, when the satellite abruptly stopped communicating with ground stations. Repeated attempts to restore contact failed week after week, with ESA officials calling off the recovery efforts today. "Despite continuous commands sent from a widespread network of ground stations, there has been no reaction yet from the satellite," ESA officials explained in a statement. There are several possible explanations for Envisat's unexpected demise. "Although chances of recovering Envisat are extremely low, the investigation team will continue attempts to re-establish contact while considering failure scenarios for the next two months." According to ground-based radar images of Envisat and photos of the craft from France's Pleiades Earth-observing satellite (which was called in during recovery efforts), the solar array on Envisat is properly deployed, officials have said. Envisat is by all accounts a huge satellite. It is about 30 feet long (9 meters) and 16 feet wide (5 m). The spacecraft weighs 17,600 pounds (8,000 kilograms) and has a huge sail-like solar array that is 16 feet wide (5 m) and 46 feet long (14 m). In 2010, space debris experts said that the satellite's immense size will make Envisat a major space junk risk for up to 150 years. ESA launched the Envisat mission in 2001 to study the Earth from space in extreme detail. The satellite carries 10 sensors to study Earth's oceans, land, ice caps and atmosphere and has been a vital resource for about 2,500 scientific studies of our home planet. Envisat’s Advanced Synthetic Aperture Radar (ASAR) captured this image on April 8, 2012 at 11:09 GMT. The image was transmitted in X-band to the Santa Maria station in the Azores, Portugal, operated by Edisoft. It shows Spain’s Canary Islands. It is the last Envisat data transmitted via X-band before the communication anomaly. The satellite has mapped the gradual decline of Arctic sea ice and tracked the regular opening of polar shipping routes in the summer months, in addition to its other discoveries, ESA officials said. "The outstanding performance of Envisat over the last decade led many to believe that it would be active for years to come, at least until the launch of the follow-on Sentinel missions," ESA officials wrote. "However, Envisat had already operated for double its planned lifetime, making it well overdue for retirement." The first launch of the new Sentinel Earth-observation satellites is slated for 2013.